You go ladies! Can they next take on Whoopi Goldberg and the rest of the liberals on The View? And while you’re at it, feel free to address Nancy Pelosi, Elizabeth “Pocahontas” Warren, and any of the celebrities who choose to bring politics into it. I love these ladies. They give a voice to everybody who is sick and tired of all the “political correctness” the left uses to silence any form of disagreement. Ladies keep doing what you’re doing. 100percentfedUp: Hollywood actor James Woods tweeted about Trump’s #1 fans Diamond and Silk today. In his tweet, Woods asks, “OMG. Why do these two gems of social media not have their own TV show? Diamond and Silk are not happy about hypocrite Maxine Waters attacks on President Trump and they’re not mincing any words in their latest (and possiblytheir funniest) video where they brutally admonish Waters. The great thing about Diamond and Silk is that they are able to voice their opinions about the failures of black politicians like Maxine Waters without fear of being labeled “racists” for disagreeing with her. 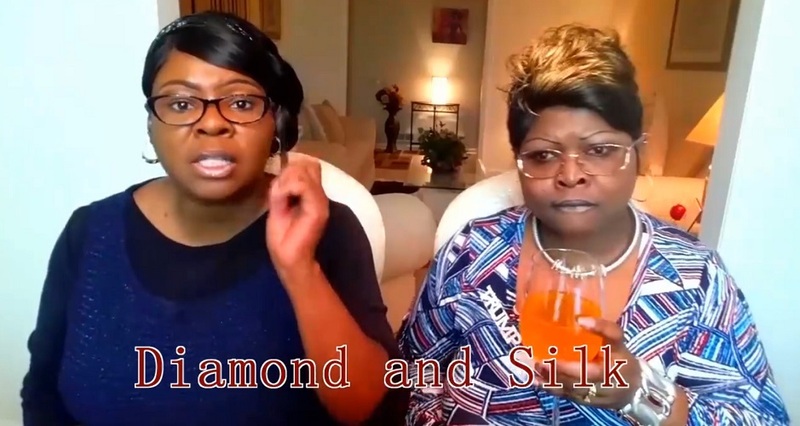 If you don’t know who Diamond and Silk are, you’re missing one of the most entertaining and downright unexplainable elements of Donald Trump’s campaign for president. Diamond and Silk are people—sisters from North Carolina, to be exact—and outspoken surrogates for Trump. Such a description obscures, however, what has made the pair a must-see act on the campaign trail. Indeed, more than anything, what distinguishes Diamond and Silk from your run-of-the-mill pro-Trump talking heads is not just that they’re black women (that is pretty remarkable itself), but their undeniable gifts for debate and punditry. Leftists are perplexed by the support of President Trump by these two outspoken black women. What they don’t realize is that Diamond and Silk are speaking out for millions of frustrated Americans of every race across America. Watch Diamond and Silk, as they call out the problem with ILLEGAL immigration in America in the video below. Through their videos, these ladies have been able to expose the truth about serious social and economic issues that are facing our nation and are only being reported from a liberal view by the mainstream media. With the perfect blend of comedy and seriousness, they have been able to tap into the feelings of frustrated Americans who feel like they’re voices are being ignored. After watching one of their videos, these ladies will almost always leave you feeling like you want to stand up and cheer! Two months before the election, Rolling Stones magazine did a hit piece on them. Tessa Stuart, the author of the article used several unfounded examples of racism by Trump or his campaign as a reason that Diamond and Silk should disavow him and run for the hood that the Democrat Party supports. Diamond and Silk simply laughed off attempts by the media to shame them. When sister act Diamond and Silk take the stage, though, the audience, sparse as it is, erupts in cheers. “Ditch and switch!” hollers a barrel-bellied man in an “I Love Women Who Vote Trump” shirt, referring to the duo’s campaign to encourage Democrats to register as Republicans.